Winter’s nearly here and we’re all bracing ourselves for a dramatic change in weather, a drop in temperature and shorter days and longer nights. Last year during the ‘big freeze’ many households ramped up the heating – an effective short-term solution that came back to bite when the energy bills landed on the doorstep. With more wind, rain and chilly weather expected this winter, and the ongoing gas and electricity tariff hikes, it is now more important than ever to look into ways of running an energy-efficient home to help reduce costs, while maintaining your home’s tip top condition and staying warm and cosy. A good place to start is with the interior of your house; simple things can be done such as checking that your heating system is working properly and invest in a programmable heating management system that will automatically reduce the heating while you are asleep or out at work. Conserve heat by wrapping your hot water cylinder with an insulting jacket and also try adding insulation to internal exposed pipes in the airing cupboard and around the cylinder. In the loft, insulate well, as draughts and the cold air quickly finds a way to circulate through the home. Insulation is relatively easy to install and it could save you up to £150 a year. With the exterior of your home, inspect your roof and guttering; check for breakages or leaks, clear out any leaves or other debris to reduce the risks of leaks and blockages during the freezing weather. Wet exterior walls cool the building faster than dry ones. Make sure the roof is in good condition; check for loose or missing tiles as well as any cracks in your chimney, as heat will easily escape through these gaps. Also, inspect your home for draughts that will let the cold air in. Particularly feel for air coming in around doors, and windows. If you find any draughts, seal them! 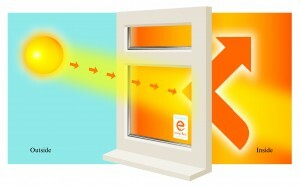 Make the most of the sun’s free energy that floods in through your windows by installing double glazing. Pilkington energiKare™ energy-efficient double glazing uses advanced glazing technology to allow more heat (energy) from the sun through the window, known as solar gain, while reducing the amount of heat escaping by keeping it on the inside. The Pilkington energiKare™ glass unit contains two types of glass; the inner pane is low-emissivity Pilkington K Glass™ that helps prevent heat escaping from the home, using a special coating that reflects heat back into the room whilst also letting in free heat from the sun. This is combined with an outer pane of Pilkington Optiwhite™, an ‘extra-clear’ low iron float glass with very high solar transmittance for consistent capture of solar energy gain. The double glazed unit is filled with argon gas to stop further heat escaping from homes by slowing down heat transfer inside the space. The glass works in three stages: the sun radiates useful heat which is readily transmitted by the Pilkington Optiwhite™ outer pane and passes through the glass unit into the building. With the heat now in the building, the inner pane of Pilkington K Glass™ acts to prevent energy loss back out of the window unit. With greater energy transmission from outside and reduced heat loss from inside less heating is needed to keep your home warm. Installing thermally-efficient glazing such as Pilkington energiKare™ will help to reduce your energy bills, whilst also reducing cold spots and downdraughts near windows, improving both comfort and usable floor space as well as increasing inner glass surface temperatures, which reduces internal condensation. For more information on Pilkington energiKare™ please link here.